Real Sociedad vs Valencia – One small step, one giant leap. Real Sociedad took a massive step towards securing Champions League football with an excellent victory over Valencia at Anoeta last night. Whilst the final scoreline of 4-2 may be slightly harsh on the visitors, they ultimately paid the price for their lack of a cutting edge in the final third of the pitch. Despite holding an advantage in possession, Valencia were unable to manufacture sufficient clear chances. La Real, meanwhile, displayed the sort of lethal finishing from transitions that has become the hallmark of their season. With Griezmann absent, Chory Castro was given a place in the starting line up, a clear indication fo a more attack minded side from Montannier as opposed to the slightly more conservative Zurutuza. Valverde opted for Cissokho in place of Guardado at left back following recent performances with Fehgouli recalled to the right side of midfield. Otherwise, Valencia were as expected. With so much at stake, this game began brightly and continued in a similar vein, really opening up as it reached the end. Valencia prompted by Ever Banega were keen to test Bravo early on and enjoyed some decent possession but Sociedad gradually grew into the game and always looked dangerous on transitions but struggled to gain any meaningful possession with Valencia pressing aggressively. 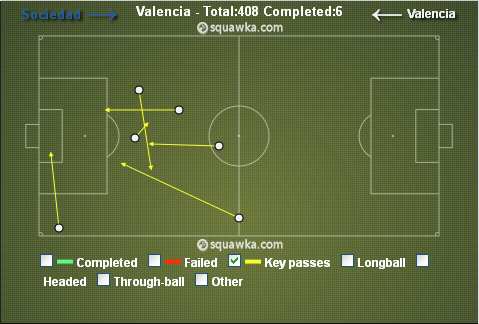 Twice in the opening 15 minutes Vela burst down the right and provided warnings to Valencia. A similar transition brought a yellow card to Cissokho when he tripped Prieto. As the game was evening out, Valencia took the lead with Cissokho charging down the left and delivering a cross which Soldado scored after stealing a yard start on Inigo Martinez. The left back would become embroiled in a number of incidents leaving him fortunate to remain on the pitch and it reduced his effectiveness as he adopted a more low key approach. Banega was drifting out of the game as Sociedad’s full backs pushed high and the home side exerted more influence on the game. Valencia had struggled to deal with a few crosses and Sociedad equalised when Vela and Prieto took a short corner and delivered a ball to Martinez who was unmarked at the back post to volley home. The second half saw both teams more stretched and the lack of width in Valencia’s play became more evident but Banega was once more instrumental in all positive play from Los Che. The game hinged upon the ability of Sociedad to counter swiftly with slick, sharp passing. The second goal was superb with Castro breaking from his own half and linking with Aguirrexte before scoring. Two further goals followed both from Aguirretxe including the final goal being a wonderfully delicate chip over the stranded Alves. Such poise and guile was shown by the frontman when the game was still hanging in the balance. In between Aguirrexte’s goals, Jonas offered Valencia some fleeting hope. With both side using inverted wingers particularly Jonas from Valencia, the onus was always going to be on the full backs from both sides to provide width in this game. 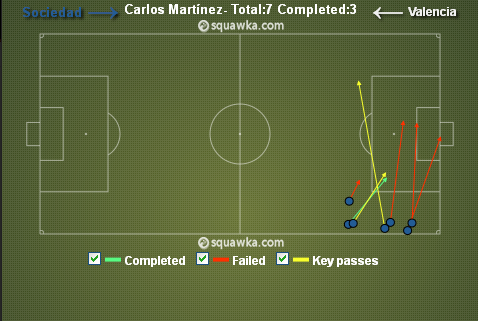 Martinez was the more adventurous ad productive full back over the 90 minutes. De La Bella on the Sociedad left also ventured forward and completed one cross from five attempted but with both Prieto and Vela leaving towards that side of the pitch, there was less onus on him to push high. Yet with Jonas cutting inside at every opportunity and Fehgouli more inclined to stay wide but having a relatively quite game, Valencia’s full backs were unable to have any effect o the game. Cissokho threatened early on and managed to deliver one successful cross from four attempted but a caution soon left him more conservative, unwilling to venture forward for fear of being caught out on the counter. Pereira meanwhile offered nothing going forward and only attempted one cross all night. The former Mallorca front man was brought into the side with Griezmann out. That Montannier selected Castro ahead of Zurutuza was perhaps indicative that he wanted to be more aggressive in attack. 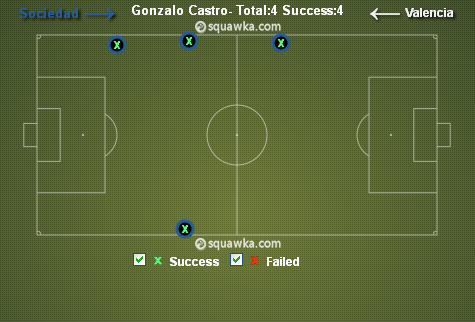 Castro made four successful tackles during the game as he supported De La Bella by tracking both Pereira and Fehgoiuli on the right. Yet he was still able to push forward and cause problems. One of the key problems from a Valencia perspective was their inability to turn their possession and territorial dominance into clear cut chances. Despite enjoying a slight advantage in terms of possession, Valencia never used the ball well in the final third with Sociedad defending very well and the onus was placed upon the shoulders of Ever Banega to create once more. The Argentine though is reliant upon his team mates to offer themselves and share the burden. With Soldado often isolated and marked out of the game, Jonas was deeper than Banega at times and Fehgouli too wide. Parejo infrequently broke forward from midfield. 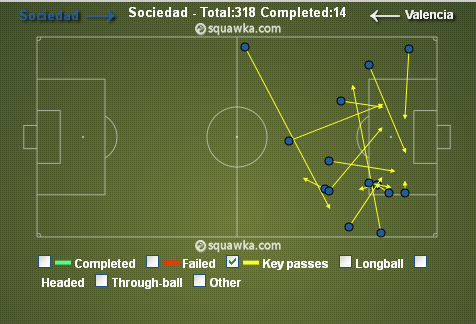 It left Banega making passes and recycling possession but not hurting Sociedad. Of course, when you are breaking into space as La Real frequently did, then it’s easier to play key passes from a two vs two situation. 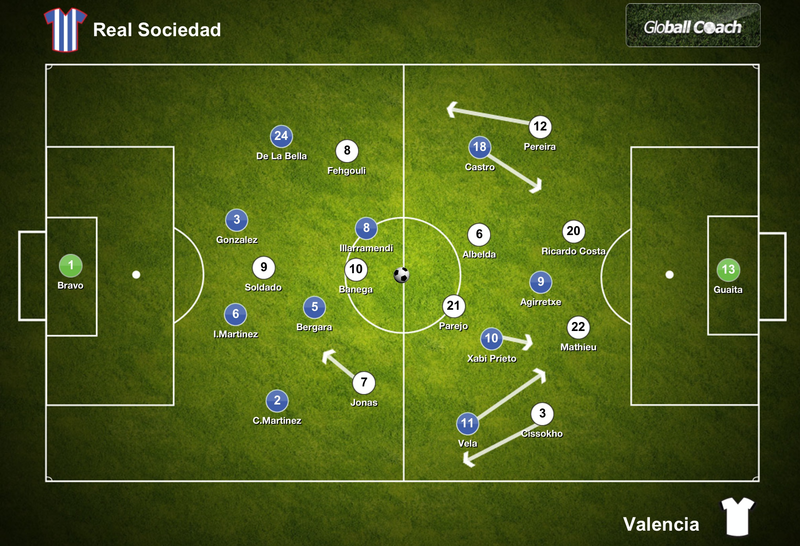 Yet Valencia knew this was how Sociedad would play. It’s how they have played for much of the season and on those terms, it was Valencia who failed to address the problems that the home side would cause. Was there an alternative to the aging Albelda in front of the defence? Should Cissokho have been withdrawn when his yellow card more of less left him unable to offer enough either defensively or pushing forward? Two teams who both sustained poor starts to the season and languished in the wrong half of the table early on but will both finish in the top six now. With five games remaining and a five point lead over both Malaga and Valencia and a superior head to head record, La Real are very much in pole position to claim the final Champions League position. The San Sebastian team have built their season around a superb run of form which has seen them lose just one game since November 2012 and even then, they really should have avoided defeat to 1o man Madrid at the Bernabeu. Qualification for European football’s premier tournament will be just reward for a richly talented squad that has grown, developed and entertained as the season has progressed. For Valencia, the ramifications of defeat may very well stretch out beyond this season. With the loss of much needed Champions League revenue, additional departures may be likely to help balance the books. The poor early season form that saw the side collect just 11 points from their opening nine games combined with instability on and off the pitch has meant they have always been playing catch up and always almost getting there but never quite making it.